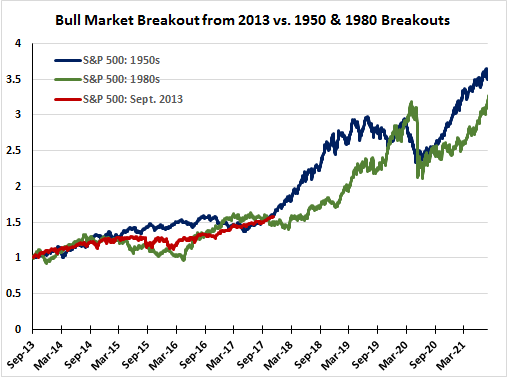 Shortly after the 2016 election in a post titled, Equity Market Beginning To Resemble Bull Market Of The 1950's And 1980's, I discussed how the equity market continued to trace a similar path as the market in the those two earlier decades. A part of my conclusion indicated the anticipated policies under a Trump administration would resemble policies implemented in the 1950's and 1980's, like tax reform and infrastructure spending. Reality is setting in and not much seems to be getting done in Washington on those two fronts; however, the current market continues to follow a similar path as in the 50's and 80's. Better sentiment and regulatory reform, even though by executive order, seems to be having a positive influence on companies. If the past is any guide then, the bull market might have at least another five years to run as can be seen in the below chart. The Sentiment Cycle Phase: "Buy The Dip"
Investment Opportunities Outside The U.S.
Is This The Market Top?